This is how Willie Davids, former head coach of Spartans and trainer of a succession of star Western Province athletes, describes the young Odessa Krause. Willie Davids, the former head coach at the Spartans Amateur Athletics Club. Odessa Krause (who today goes by her married surname ‘Swarts’) was first spotted as an under 15 athlete at the Ned Doman Secondary School in Athlone, Cape Town in 1989. Competing at the Champion of Champions at the Athlone stadium in 1989, she caused an upset when she beat the SASSSA champion of the previous year Lavenda October of Mondale High School in Mitchell’s Plain. She did the double (winning the 100m and 200m) and subsequently qualified for the Western Province Senior Schools’ Sports Union (WPSSSU) athletics team. “I remember this short girl from Mondale High School, who always gave me a run for my money in the 100m. She made me work really hard,” Krause recalls. 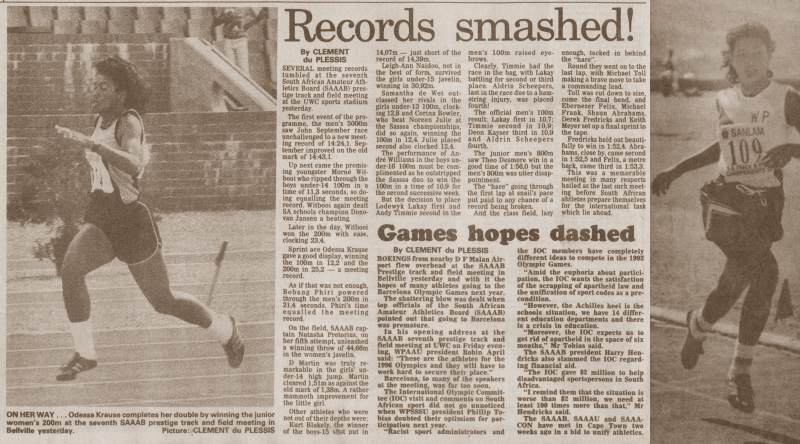 October had comfortably taken care of Krause and the rest of the under 14 girls’ sprinters in 1988. Just one year later, though, the tables were turned. Krause’s winning margin over October surprised the coaches at Mondale High School – the WPSSSU champion athletics school at the time. Lavenda October, the 1988 SASSSA sprint champion, sports her WPSSSU tracksuit and blazer. The coaches Nazeem Smith and Clement du Plessis had both been members of the Spartans Amateur Athletics Club and du Plessis immediately put Krause in touch with Coach Davids at the club. Needless to say, Davids did not hesitate to take this high-calibre sprinter under his wing. Once she joined the Spartans Amateur Athletics Club in 1989, she became part of a very talented group of athletes – all of whom were terrific in their disciplines: Julian Williams, Teano Patience, Pierre Abrahams, Charles Sprinkle, Jerome Sprinkle (also Ned Doman schoolboys), Leon Rossouw, Graham Schaffers and Graham February. Though she moved with her mother and two sisters from Athlone to Scottsville, just outside Cape Town, in 1990, Krause remained a member of the Spartans Club. WPSSSU and SASSSA sprinter Pierre Abrahams, left, of Spartans. While at Scottsville, Krause attended Scottsville High School, where she received training from the brilliant Tygerberg wing Cliffie Booysen. “Mr Booysen started coaching me after school and he invested quite a lot in me,” she recalls. In 1990, Krause set Athlone Stadium on fire with her sizzling hot performances in the 100m and 200m. She blazed to provincial records in both the 100m and 200m on the grass track – against Cape Town’s infamous South Easter, a strong wind that blows away the city’s smog during the summer months. Odessa Krause shows the class of a top-quality sprinter. Following her top-notch performances at the inter-schools and Champ of Champs meetings, Krause ran through the Western Province (WP) schools team, clubs and South African (SA) schools and clubs, mercilessly setting records in the 100m and 200m. Only the weather elements and the record books were her rivals – an absolutely dominant sprinter. By the time Krause quit athletics, and South Africa entered democracy, she held more than six sprint records spread across high schools and clubs at both provincial and national levels. In 1990, she held the WP senior schools’ record for girls under 16 in the 100m (12,41 secs) and 200m (25,84 secs) respectively. During the same year, Krause equalled Maureen van der Ross’ SAAAB junior ladies’ 100m record of 12,1 seconds at the UWC Stadium. In the 200m, she broke van der Ross’ 200m record of 25,3 when she clocked 25,0 seconds. She also held the WP senior schools’ record for girls under 17 in the 100m (12,32 secs) and 200m (25,67 secs) in 1991 respectively. In 1991, Krause held the SA schools’ 100m record of 12, 3 secs, together with Qanita Nazier, Shamiela Jordan and one of the great sprint champions, Sandra Petersen. However, Krause was the sole record holder of the SA schools girls’ under 17 200m event. Her time was 25,3 secs set at the SA schools’ meeting held on the Paarl clay track in 1991. In the 200m, she had broken Ingrid Arendse’s long-standing record of 25,7 seconds set in 1979 – also set on the same track in Paarl. For good measure, she anchored the 4x100m relay to an SA schools’ record of 50,1 secs. Odessa Krause, in SASSSA colours, with a teacher from Scottsville. “I guess, I never knew how talented I was until now [present day]. I think I took it for granted back then. But still I don’t have any regrets how my life played itself out,” says Krause, whose son Wayde van Niekerk is the World, Olympic and World Record Holder in the 400 metres. Krause was truly a talented speedster to behold – she had a real presence on the track. She competed regularly in the student league meetings at the University of the Western Cape and was, not surprisingly, an athlete of the day at such a meeting, pocketing a R250. The club athletic meetings and the student league meetings under well-known sports administrator Wilfred Daniels, which had started in 1985, had reached a crescendo by 1986, and a large number of quality athletes had been maintained until 1992. “I found club athletics to be more difficult and tougher but I still had fun as I got the opportunity to compete against the seniors. When I beat Amiena Dollie [as a senior ladies athlete of Olympiads] that victory was a big stepping stone and honour for me. She was the best sprinter at that time. I never had the opportunity to compete against Sandra Petersen,” recalls Krause. Dollie was a joint girl’s under 15 100m record holder (12,5 seconds set in 1984). The race against Amiena Dollie (Olympiads), left, inspired Odessa Krause (Spartans). Krause remembers Petersen as being the captain of the Western Province team in 1989. “I loved the way she kept calm at races and how she motivated us as her juniors. She was my WP captain in 1989 and I followed her every move. She just had a way of carrying herself and I always wished I could be like her. She was truly a role model,” says one star sprinter of another great in Sandra Petersen. Earning South African Amateur Athletic Board (SAAAB) colours “was the highest accolade an athlete could achieve” during the isolation years in South Africa. However, schools (SASSSA) and colleges (SATTCSA) had the first preference in the selection of athletes to their national teams. While running under the banner of the South African Council on Sport (Sacos), says Krause, the beating of Dollie and watching Shaun Vester run have “always inspired” her. But, surely, there must have been other factors that made Odessa Krause, easily, one of the top sprinters in the fold of Sacos alongside Suezette Arendse and Sandra Petersen. She seems to have gotten her genes from her dad Edward Krause, 65, who still rides the Argus Cycle tour. And now with her son, Wayde, it is clear the apple does not fall far from the tree. Sandra Petersen, left, of Mondale High School and the Olympiads Amateur Athletics Club was one of the best sprint-long jumpers in the fold of the South African Council on Sport (Sacos).